Turbo charger and upgraded parts in the 6.0 Powerstroke increase the compressed airflow into the engine with more fuel. If this mix of air and fuel is not matched, poor performance and bad fuel economy are the result. Unburned fuel (black smoke) is wasted energy. 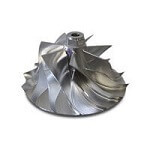 This energy could be recovered for more power with an upgraded or larger turbocharger. 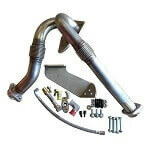 Featuring T4 turbo mount systems, Powermax, and KC 6.0 turbo upgrades.